Source: Maritime New Zealand, 2017. Chances of getting a job as a fishing skipper are average, but expected to improve due to an ageing workforce. <2 years of training required. Pay for fishing skippers varies depending on the size and type of the boat they operate and whether they own it, the fish species being targeted, and the size of their catch. Inshore fishing skippers usually earn between $40,000 and $80,000 a year, and a few may earn up to $100,000. Deep-sea fishing skippers can earn between $130,000 and $280,000. undertake maintenance and emergency repairs. knowledge of the Fisheries Act, Maritime New Zealand requirements, and fishing quotas. work in all types of weather, and in conditions that may be cramped and hazardous. My name is Chris Patrick, I am a captain for Talley’s Fisheries on the Amaltel Columbia. We work a deep-sea factory trawler predominantly around the coast of New Zealand, off the west coast of the South Island as well. The deep-sea fleet is predominantly bigger vessels and the inshore fleet being the smaller vessels. We generally do around six weeks, 30 to 40 days is an average trip. Generally for fishing we use electronic - we've also got in conjunction with our sounders now, we've got the 3D mapping system which maps the ocean floor so basically it’s a topographical map of the ocean floor and we build those with our sounders, ourselves. So we take depths and they’re becoming detailed, the more we use them, we get a very, very good look at the ocean floor. You can actually see where and why the fish go to certain places and it allows you to keep away from certain places too. You find after the spawn it quite often happens, you’ll have a substantial amount of fish on the coast that are there spawning, they’re grouping up and schooling up. You can’t even track them, they go from massive schools of fish and then all of a sudden they're instantly gone. Then we go back to what we call the feeding grounds which is predominantly what we spend most of the time during the year on, fishing hoki. Careerwise it’s absolutely fantastic, it really is a good career. From the age of seven I wanted to be a fisherman so, you know, I cranked into it at 15 and really never looked back, you know, it’s been fantastic. I mean it is a challenging role, as a captain you’re not just catching fish - that’s probably 50% of your role. They formed a company specifically for the sustainability of our main industry that we predominantly fish which is the hoki, and they do for the other species as well. 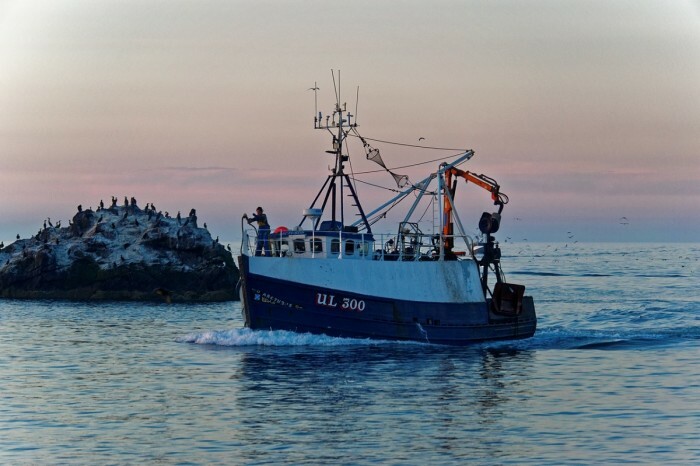 We have a lot of areas that we don’t fish for small fish stocks, which is one of the reasons our stocks have increased substantially in the last five to six years. It’s in our best interest to protect all the other species, we have a lot of codes and rules we stick to with the likes of seals and seabirds and anything like that - move on rules - so we might steam on two or three miles and leave them behind just so there’s no, or very minimal risk of catching them and getting them in the nets. Probably on average at least three to four times a week we’ll have fish somewhere in the menu, either lunchtime or dinnertime. I mean you can’t work on a fishing boat and not you know, the fish is fresh and nice and you know a good selection so it’s pretty hard to go past fresh seafood that’s for sure. Fresh hoki is absolutely beautiful and the snap frozen stuff we did is great. I'm quite fond of beer batter and plenty of lemon, a bit of lemon pepper, it’s beautiful. To become a fishing skipper you need to have relevant Maritime New Zealand approved experience and qualifications. pass Maritime New Zealand qualifications relative to the size and weight of the vessel. a skipper fishing vessel unlimited (SFV-U) certificate. a skipper fishing vessel limited (SFV) certificate. Fishing skippers who run their own boat must hold a fishing permit and Annual Catch Entitlement (ACE) and/or quota shares. There are no specific secondary education requirements to become a fishing skipper. However, biology, geography and maths are useful. Fishing skippers on inshore fishing boats need to be fit and healthy, as their role involves a lot of physical labour. Physical fitness is less important for deep-sea fishing skippers, as their role is usually confined to the wheelhouse. Fishing skippers who own their own boat must register their vessel. The fishing skipper workforce is ageing and many will retire over the next five years, which will create more opportunities for people wanting to enter the role. The best way to become a fishing skipper is to get a job as a deckhand and work your way up the ranks, gaining the necessary maritime qualifications along the way. On smaller inshore fishing boats, skippers either own the boat they operate, or are directly employed by the owner. On larger deep-sea fishing boats, skippers are employed by the company operating the boat. Most of the 1,500 fishing boats registered in New Zealand operate in inshore waters, only about 35 have deep-sea fishing permits. Crawford, K, international shipping manager, Maritime New Zealand, Careers Directorate – Tertiary Education Commission interview, November 2017. Sinha, S, senior technical advisor, Maritime New Zealand, Careers Directorate – Tertiary Education Commission interview, November 2017. Taylor-Smith, G, senior technical advisor, Maritime New Zealand, Careers Directorate – Tertiary Education Commission interview, November 2017. Fishing skippers can progress to work on non-fishing vessels or move into onshore management roles, such as vessel manager, within a fishing company. They specialise in either deep-sea or inshore fishing. Deep-sea fishing skippers may lead a large crew and play a managerial role on the fishing boat. Inshore fishing skippers may have just one crew member working for them. They have a more hands-on role in operating the boat and catching fish. Ship's officers navigate and control the safe operation of a ship and supervise and co-ordinate the activities of deck crew. Fishery officers gather information on all aspects of the fishing industry and enforce fisheries laws. Ship's masters are in charge of a ship, its crew and any passengers or cargo it is carrying – on the water and in port. On tugs or pilot boats, ship's masters may guide or assist ships in and out of harbours or through difficult waterways.